by Darren Cockburn. Reviewed by Gabriel Constans. There is an excellent summation at the end of each chapter called Points For Reflection, shared personal experiences in each section, and some well-designed diagrams throughout Being Present. Mr. Cockburn has presented a well-balanced, practical, and insightful book that is applicable for the novice or seasoned practitioner of Presence and mindfulness. I recommend reading it cover to cover, or as a quick reference. My Inner Child – A Collection of Poetry by Regina Puckett. Here are fifty insightful, introspective poems that explore feelings, thoughts, compassion, understanding, love, choices we make, and the reactions we take. With rhyming prose and poetic awareness, Ms. Puckett reveals the time we waste in self-judgment and of judging others. My Inner Child displays the preciousness of the present, and how fleeting this moment can be, with awareness and lyrical style. In some respects, My Inner Child is not only a collection of poems but also a journal, and self-revealing observation of working on oneself. Regardless of how many people we are with, know, or call family, life is essentially traveled alone. We can look within and witness the lives of others, or go around in habitual conditioned circles. Is there someone to ground us, to connect with; someone who understands? will you feel my sigh? Purpose – Volume I: Meditation On Love, Relationship, Fear, Death, Intuition, and Power – Uncovering Our Resistance To Life by Noura. Reviewed by Gabriel Constans. Purpose is a brilliant artistic exploration of our hearts and minds, what we see, and what we tell ourselves about our experience. Noura looks at, and investigates, major principles and subjects within meditation, psychology and philosophy, with clear vision and insight. Her descriptions of words and phrases (awareness, belief, conflict, content, energy, form, ideas, illusions, intelligence, reality, sacrifice, selflessness, truth, etc.) are spot on and all inclusive. She simplifies what can seem complicated. This is a book about asking questions. She says, “Is it possible to have clarity about ourselves that enables us to understand ourselves totally, so we never have to rely on any belief? If we can look and see clearly for ourselves, are beliefs necessary?” The author asks readers’ to look in the mirror. “What is purpose? What is our purpose? How do we find it? Where do we look? What gets in the way of seeing it?” We seldom stop to ask ourselves such questions, let alone inquire deeply into what these questions mean. Noura also looks at projection, magical thinking, darkness/fear/unknown, and duality, with a section about mental health. She says, “Psychological Hygiene is the habit of building awareness through observation, self-inquiry, and self-contemplation…” “Very often, we focus on what’s going on externally at the detriment of what’s going on in the inside.” The stories and tales told in Purpose, lend further credence and understanding to the concepts and inquiry provided in this engaging and insightful volume. Who Are We: Seeing Ourselves Through the Eyes of One Another by Hussam Atef Elkhatib, Ph.D. Reviewed by Gabriel Constans. Though many of the topics may seem obvious at first, I have never seen such an extensive collection, and discussion, of all the factors which shape who we are, and how we behave, in one place. Each area is looked at closely with short essay-type sections. To give an overview of what is offered, here are some of the chapters that are included: 1) When You Were Born 2) Where You Were Born 3) The Control We have over What 8) How We Are 11) The Reason Behind Everything 13) The Art of Thinking 18) Internal Influences 20) Our Perceptions 24) What We Believe 26) Seeing the Big Picture. Here is an example of some of the thoughts within. Nothing new, but said simply and with insightful precision. Seeing things the way they are enables us to accept reality and deal with it. It contributes to our peace of mind. People are eventually the same. Some of the things they can control while other things they have no control over. We are more alike than we are different, though it is in observing and studying the differences, and how our environment, home, country, beliefs, conditioning, thoughts, and actions create who we are, that we begin to see the basic humanity that runs through us all. When our minds are open, and we look at our thoughts, it provides the opportunity to also see ourselves through the eyes of one another and discover that who we are is always in relation to other people, things, and circumstances. Take the time to ask the question, and open the pages of Who Are We. Tapping Success Scripts: EFT SECRETS to Create Wealth, Work, Weight Loss, Physical & Emotional Well Being For You, Your Loved Ones & Pets. By Colleen M. Flanagan. Reviewed by Gabriel Constans. So, yeah, the title is a mouthful, but the book covers every one of the aforementioned subjects, and beyond. If you’ve tried one thing after another to deal with fear, anxiety, and other emotional difficulties, without any relief, consider Tapping Success Scripts, and EFT (Emotional Freedom Techniques). I was interested in Tapping Success Scripts to see how it differed from TFT, which I’d learned from Dr. Callahan years ago, and have been using and teaching others for many years, especially those experiencing trauma and grief. Like TFT, many practitioners of EFT claim that it works for everything from fear of loss, to curing cancer, or becoming wealthy. In my experience, TFT has been helpful for anxiety and trauma, but not as much for depression and other issues. Ms. Flanagan describes the EFT process; what to say to yourself for an issue (such as fear); and where to tap on the body for each specific ailment, be it emotional or physical. I especially appreciated her top 10 tips to make EFT more successful, and her awareness of what we tell ourselves, and getting to the core of our concern, such as the thought that we often think we need to be perfect to be loved, accepted, or obtain something we desire. The advantage of EFT (and TFT) is that it does no harm, you can do it yourself, and though there are a variety of steps to take for each specific ailment, or issue, they are well explained and described throughout, and repeat many of the same actions for each. You do not have to “believe” these techniques work, or have some magic explanation for why they do. Simply give them a try and if you notice any difference, then you (and others) will be better off in every aspect of your life. The secret to living mindfully. Just don’t breathe a word of it.. I haven’t seen any book quite like this since the classic Be Here Now, by Ram Dass, back in 1971. Those pages about consciousness, meditation and oneness, opened my eyes to seeing life in new ways, and discovering that I was not a victim of circumstances, or destined to live with pre-conceived conditions. In many ways that book saved my life. The art of breathing can save yours. Though half the size of Be Here Now, the art of breathing is also similar in the way it is designed, using different fonts, layouts, and illustrations, throughout. Dr. Penman includes sections on breathing, happiness, curiosity and awareness, that are straight (or circular) to the point(s), easy to understand, and even easier to practice. There is also a link included to an online site that has all of the meditations available. “You are not your thoughts. You are the observer of your thoughts. It’s a subtle distinction that’s only perceived with practice. Your thoughts are a running commentary on the world; a ‘best guess’ of what’s truly happening. Often, your thoughts will reflect the powerful emotional currents swirling through your mind, body and breath. Sometimes they are true, sometimes they are a frantic work in progress, sometimes they are wrong. There you have it. The means to not get caught in drama after drama, but learn to pause, take a breath, and observe the dance. Our experiences are shaped by stimulus and response. It is the space in between, the breath, that provides the opportunity to see what is there and make conscious choices. The art of breathing is an international best-seller, and when you get your copy you will see why. Become conscious – one breath at a time. 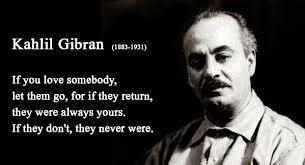 From The Treasured Writings of Kahlil Gibran. Translated by Anthony Rizcallah Ferris and edited by Martin L. Wolf (1951). Song of Love by Kahlil Gibran. Wine, and the heart’s nourishment. Whole life becomes reality of sweet dreams. Child, adored by a merciful mother. It shuns the empty claim of the voice. He drew wisdom from my presence. The Valley of the Nile. I am more violent than a raging tempest. Madness does not evidence my presence.